By 2030, the U.S. Census Bureau projects that one in every five residents will be older than age 65. What do we know about older workers’ labor market participation and earnings today? 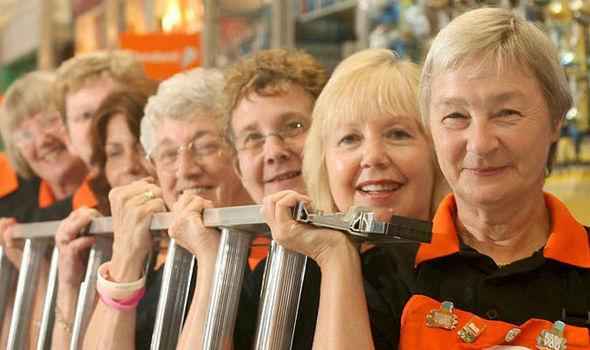 We know that the number of older workers is on the rise. We also know that these workers are not only making more money on average than ever before but are outpacing the average earnings growth of other age groups. That is the observation of Erika McEntarfer, in a recent posting from the U.S. Census Bureau, “Older People Working Longer, Earning More.” Entarfer is head of research for the Longitudinal Employer-Household Dynamics (LEHD) program at the Center for Economic Studies (CES) at the U.S. Census Bureau. The ratio of workers to population of persons aged 65 and over has risen from 12% in the mid-1990s to over 18% in 2015-16, the latest available data. (Bureau of Labor Statistics) While that leaves more than 80% of those 65 and older outside the work force, it is a demonstrable trend that could very well accelerate as more Baby Boomers turn 65 and longevity continues to increase. As the chart indicates, average monthly earnings, adjusted for inflation, rose for all age groups from 1994 through 2000, when it levelled off for the youngest groups (14-24 and 25-34) and increased more slowly for the three groups from 35 to 64 years old. Striklngly, the 65+ age group was the only one to show a steady increase in monthly earnings since 1994. Inflation-adjusted average monthly earnings for older workers rose from $2,274 in 1994 to $4,092 in 2015, an 80% increase—the largest of any age group. Other groups ranged from 17% for ages 14-24 to 41% for 55-64. Inflation from 1994 to 2015 was 37% (US Inflation Calculator). That represents an average of 1.7% per year. The average increase in wages reported here means that real earnings improved by less than 1% per year for the youngest group to nearly 4% for the oldest, and roughly 1.5-2.0% for the three highest-paid groups (35-64). The highest average monthly earning in 2015 was $5,753 for ages 45-54. Even though we can assume that many in the 65+ group are working part-time, their monthly earning remained higher than the two youngest groups. A potentially troubling trend deserving attention is the levelling in the trend for 24-34, the group that traditionally would be entering the workforce and starting to move up. 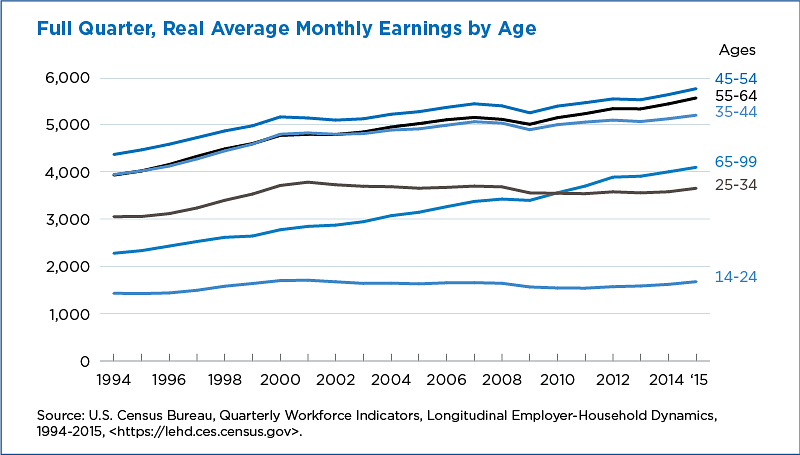 Since 2000 this age group has not only seen monthly earnings plateau, but move down slightly. From the chart, it can be deduced that all of its 20% gain occurred between 1994 and 2000. Remember that people are passing through these age groups—the 18 year-old in 1994 was 41 in 2015, and the 50-year-old in the peak earning group in 1994 was 71 in 2015. The potentially worrisome thing about the flattening of the 25-34 trend line is what it says about work in America and the apparent break in patterns established in post-World War II decades that created a large and vibrant middle class. Even worse is the nearly flat trend for the 14-24 group, which saw an increase in inflation-adjusted earnings of only $245 per month, or 17% over two decades. The earnings statistics cited in this release do not indicate the source of the earnings. Further research is needed to distinguish what percent of older workers are working full-time at jobs where they have worked for many years, versus what percent of older workers are in part-time jobs. More research is also needed to understand the degree to which the earnings of older workers supplements any retirement income they receive from other sources. This article was also posted on SeniorLifestyle.org.